Current Pending Sector Count S.M.A.R.T. parameter is a critical parameter which indicates the current count of unstable sectors on your hard drive. The raw value of this attribute tells us about the number of sectors waiting for remapping. If some of these sectors are read successfully, then the value decreases. 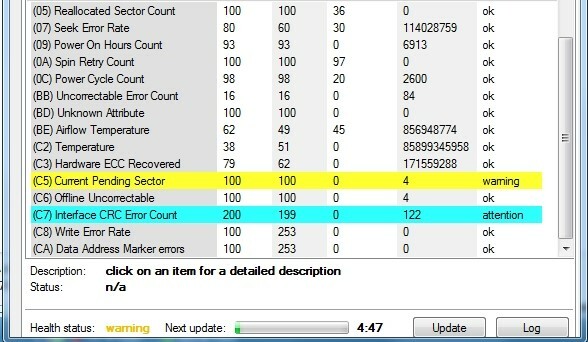 If errors are still showing up when reading a sector, the hard drive will try to recover the data, transfer it to the reserved disk area and mark this area as remapped. Note that it is a critical parameter and an increase in this value can lead to driving failure. It is recommended to go for data backup and hardware replacement. Do not store any new data on the disk as well. Run check disk and see if the number changes. Complete formatting of your drive will also remap all the bad sectors. However, you should have a backup of all the data before going for a format. If you lost data due to the presence of many bad sectors on the drive, you can still recover data from the hard drive with Remo Recover software. The software scans the entire drive for bad sectors. It creates a disk image of the drive bypassing all the bad sectors and then recovers data from this image. This Hard Drive Recovery software also performs lost partition recovery from SSD in few simple steps. All you need to do is download the software, follow on-screen instructions and get back all your data in a matter of few minutes! Remo Recover can also restore all the lost, deleted, formatted or re-formatted data on your hard drive. There are times when your hard drive is not detected by the computer and you will not be access data within it. You can still recover data from undetected hard drive using Remo Recover data recovery tool. If you had formatted your hard drive and reinstalled the Operating system, Remo Recover can still restore data. The file systems supported by the software include FAT16, FAT32, NTFS, NTFS5, and ExFAT. The software works on all versions of Windows and Mac Operating systems.